Wizards of Oz: LHC: Game On! Hadrons are particles comprised of bound quarks, such as the protons and neutrons that make up all of the elements on the Periodic Table (as compared to "leptons", or "light particles", with no quarks -- such as electrons). At full power, this 27-km diameter synchrotron will accelerate protons in opposite directions to 99.9% the speed of light -- then shunt them into a collision chamber to see the results. 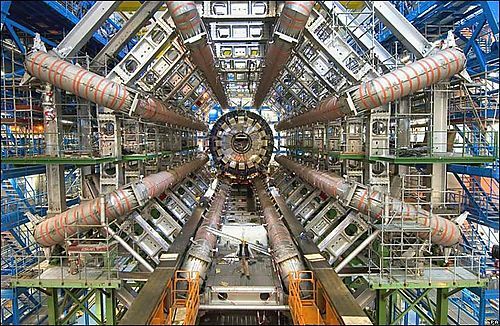 Some are expecting to see the "Higg's Boson", the last of the "Standard Model's" predicted particles yet to be observed. The Higg's Boson would help explain why some massless particles (like photons) can cause other particles to have mass -- which can in turn help us understand "mass" far beyond Einstein's famous relativistic formula "E=mc^2". Stay tuned to this journey of discovery into the very essence of matter! UPDATE: For an even more humorous spin (pun intended :-), check out Randall Munroe's strip "xkcd" from yesterday on the same topic. Bonus points for those who can find the six quark names hidden in the strip!